Intertops is one of the highest rated online sportsbooks on the web and it’s a place where players can bet on many of the world’s top sporting leagues and events. With their 25 years of experience, Intertops caters to the need of every punter. 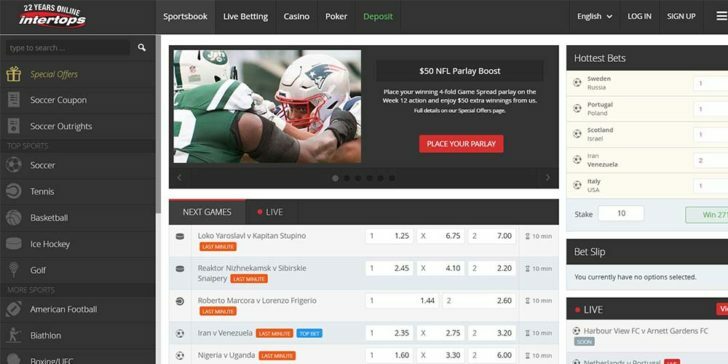 They were the first company to offer online sports betting, and now Intertops has 400,000 customers worldwide. This gambling site even offers an exciting Intertops Poker Room and a complete Intertops Casino. The Vegas-style casino at Intertops will give players all the thrills of a…Vegas casino! Intertops knows how to attracts players and how to satisfy their need for a great betting experience. Intertops flexible deposit bonuses are a very good idea and Intertops players can choose between ROOKIE200, ROOKIE100 or ROOKIE50 (ROOKIE200 offers 200% Max. $50 Bonus, ROOKIE100 offers 100% Max. $100 Bonus and ROOKIE50 offers 50% Max. $200 Bonus). Intertops has nearly 1,000 different wagering options on daily sports for players to bet on. 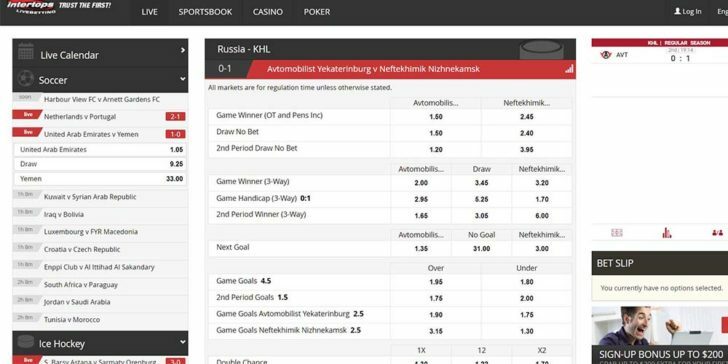 There is even live interactive betting to add more fun to the game. Intertops also gives the option to place half-time bets. In addition to their generous bonuses, Intertops gives regular special offers to help boost players’ accounts. All the action, fun, and excitement of online sports betting are now just a click away! Choose from 4 Intertops Bonus Codes for Your First Deposit Play! One of the Best Refer a Friend Promotions can be Found at Intertops! Play! Join Intertops Sportsbook and Win Final Four Tickets! Play! Win a Trip to Super Bowl 52 Final in Minneapolis Thanks to Intertops Sportsbook Play! Earn Money Back to Bet on Golf Online With Intertops Sportsbook Play! Earn Money Back on Wimbledon Bets This Month at Intertops! Play! Earn a 50% Bonus On Your Next Intertops Deposit to Celebrate the NBA Finals Play! Earn Money Back on a Losing Champions League Bet with Intertops! Play! Boost Your Masters Betting Profits at Intertops! Play! Enjoy the Best Parlay Promo at Intertops Sportsbook Play! The 50% March Madness Bonus at Intertops has Everyone Talking! Play! Win Free Tickets to the Final Four with Intertops! Play! Members of Intertops Can Now Win a Free Trip to the Final Four! Play! Win a Free Trip to the Super Bowl with Intertops! Play! Win a Free Trip to the SuperBowl With Intertops! Play! Protect Your Sevilla vs. Barca Bet with Intertops! Play! Wimbledon Betting Bonus at Intertops if match goes to “overtime”! Play! March Madness Bracket Promotion Offers $25,000 at Intertops Sportsbook Play! Get the $100 Super Bowl Deposit Bonus at Intertops Sportsbook Now! Play! Bet on Second Royal Baby’s Name at Intertops Sportsbook Play! Intertops Sending One Lucky Punter to Super Bowl! Will It Be You? Play!